State wildlife experts say the red fox population in the Wood River Valley won’t bounce back to its previously inflated numbers any time soon—and that might not be such a bad thing. Vulpes vulpes, as the red fox is more formally known, was a common sight around the valley for several decades. Idaho Mountain Express archives show the fox population had reached a “boom” in 1999, and the animals were regular sights on golf courses and at back doors, looking for handouts. An Idaho Fish and Game conservation officer said at the time that he got seven to eight calls a year from people who suspected their cats had been killed by foxes; still, valley residents continued to feed the foxes, despite cautions from Fish and Game officers. “They’re cunning enough to find their own groceries,” Idaho Department of Fish and Game regional fur-bearer specialist Mike Todd told an Idaho Mountain Express reporter in 2007. Regan Berkley, a regional wildlife biologist, said last week that over-feeding by humans led to an overly dense population of foxes in the valley. The fox population began to decline sharply in 2009 as a result of mange that spread quickly among the overly dense population. Mange is caused by a tiny mite that burrows under an animal’s skin, causing irritation, infection and loss of fur. Foxes with mange have scruffy-looking fur, or no fur at all on tails or patches of their bodies. Berkley said mange is common among canine species, but the “artificial situation” caused by the dense fox population was unusual. There are no official surveys done of foxes in certain areas. Idaho Department of Fish and Game Wildlife Staff Biologist Craig White said the one measure of fox population the state has is a “catch-per-unit” measure, which is a number that takes into account how many animals are trapped per hunter per game unit, and how many nights it took the trapper to catch that animal. White said department records show that that number is down for red foxes, which could indicate a statewide drop in population. Then again, he said, it may not. Magic Valley Regional Conservation Officer Lee Garwood said he estimates the Wood River Valley has lost roughly 80 to 90 percent of its fox population over the past five or six years. Berkley said the foxes did not fill any real ecological niche, and there have been no negative impacts from the species’ local decline. Though parts of the valley saw a rise in the vole population a few years after the fox population dropped, she said the two events were unrelated. However, the foxes in the valley are starting to look healthier. Far from the sickly, scruffy animals that used to wander the valley, Garwood said, the animals are looking much healthier. But other canines are not faring as well. Berkley said coyotes and wolves in the region have been displaying symptoms of mange—but the parasite is not likely to have as much of an impact on those species as it did on their smaller, brighter cousins. Berkley said the populations of coyotes and wolves are not as dense as the foxes, and the mange is less likely to spread from family group to family group. A 2002 paper published in the Wildlife Society Bulletin suggested that the bright red and white foxes found from Ketchum to Twin Falls might not be native to Idaho. According to Jan Kamler and Warren Ballard, the paper’s authors and faculty at Texas Tech University, stated that native red foxes only exist in higher elevations, and tend to be characterized by a distinct black or silver pattern among a pale red or yellowish coat. Non-native foxes are dark red and are a European species that existed mostly on the East Coast before spreading across the nation in the 20th century. 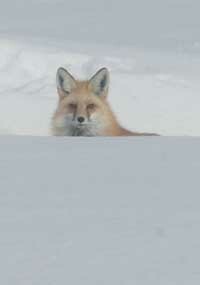 Kamler and Ballard state that non-native red foxes also tend to occur at higher population densities than native foxes.